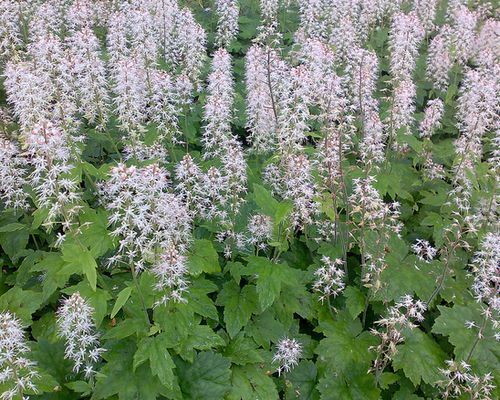 Tiarella are hardy perennial woodland plants that range from 30 to 60 cm in height. They have heart shaped green leaves that change in colour to red in the autumn. Tiarella plants come into bloom from late in spring through to early summer, when they carry feathery white flowers on spikes. A common name for Garden Tiarella is the Foam Flower. Tiarella (Foamflower) by Matleena Laakso. Common Names: Foam flower, Coolwort, Laceflower, Sugar-scoop, False miterwort. Height: 12 to 20 inches (30—50 cm). Flower Details: White. Small. Feathery. Star-shaped. Terminal spikes. Foliage: Herbaceous. Pale-green becoming bronze-red in the autumn. Cordate or tri-palmate-lobed. Sowing: Surface. Germination time: two weeks to three months. Spacing 6 to 20 inches (15—50 cm). Seed: Method 1: Seeds should first be sown into flats in the autumn. Next sink the flat into the ground in an area that offers shade, preferably close to a wall that faces north. Provide a glass/plastic covering. Keep an eye on the flats to ensure that the soil remains moist. Bring the flats indoor at the beginning of spring and keep at 50°F (10°C). Transplant seedlings outdoors following the last frost. Seed: Method 2: In the spring, sow seeds on a moist growing medium in flats, wrap in a large plastic bag, then stratify by refrigeration for three weeks. Next bury the flat as described above. Transplant seedlings to their final location in the autumn. Requirements and care: Full or partial shade. Good drainage. Acidic soil pH 5 to 6. Cool, rich soil. Mulch. Regular watering during dry periods. Propagate: by dividing at the start of spring in cooler areas or the autumn in warmer areas. Miscellaneous: The genus derives its name from the Greek word for turban (Tiara) and relates to its unequal seedpods. The seeds of the Foam flower should first be grown in flats, and they can be sown in either the autumn or spring; seeds should be sown on the surface. If planting in flats in the autumn then sink the flat in a shady area and cover in glass; keep soil moist; bring indoors for the winter when it starts to get very cold. If growing Tiarella plants in the spring then first imbibe the seeds by putting the flat in a black bag, then placing in the fridge for three weeks. Next sink the flat into a shady part of the garden, cover with glass and keep moist. Once young foam flower seedlings appear remove the glass and allow to grow in situ; transplant the seedlings to their final location in the autumn. The Tiarella plant can grow in either shady or partially shaded areas and likes a cool acidic soil (pH 5 to 6), that is rich, well drained, and moist. The plants should be spaced from 15 to 20 cm apart (small Tiarella) to 30 to 60 cm apart (larger varieties). It is fairly easy to look after Foam Flowers and other Tiarella, they are woodland plants so like a cool moist soil; so apply a wood chip mulch to help maintain soil moisture and coolness, and water regularly. 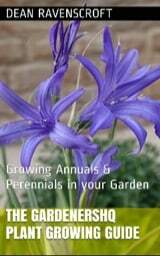 If you require more plants then they can be propagated by division in the spring.